Take a trip to America’s biggest party town in Vegas Diamonds. Created by ELK Studios, this 3 reel, 5 payline game combines elements of the classic fruity with some fresh extras. They include wild multipliers of up to 5, respins and a spin the wheel bonus that awards cash prizes and free spins with even more multipliers. Stakes range from between 20p and £100 per spin. The sights and sounds of Sin City are on display in Vegas Diamonds. You’ll see the hotels and casinos of Vegas in the background as well as a stretch limo above the reels. It’s all suitably glitzy. On the reels are cherries, lemons, melons and single, double and treble bars. Land 3 matching symbols in a line to create a winner. The Vegas Diamonds symbol is the most lucrative. Land 3 of these in a row and you’ll pocket 30 times your bet. The Vegas Diamonds nudge into the middle row if you find 3 of them anywhere on the reels together. This is known as the Vegas Diamonds Nudge feature. Vegas Diamonds looks like an old school fruity. There are some funky extras thrown in to spice up the action though. There are 4 wild multipliers on offer – as well as substituting for everything bar the bonus, the wilds also comes with a multiplier attached. These boosts payouts by 2x, 3x, 4x or 5x. Perfect Match Respin feature – if the same symbols appear on reels 1 and 2 together, they will freeze and you’ll be awarded 3 respins of the third reel. This can give another chance to land the bonus wheel or just land some big 3 of a kind combos. Vegas Diamonds Fortune Wheel feature – the main feature is the bonus wheel which is triggered by landing 3 Bonus scatters on the same spin. You’ll then get 3 spins of the Wheel of Fortune-style wheel. There are bronze, silver and gold wheels with prizes increasing on each one. You get to a higher level wheel when the pointer lands on a Level Up segment. As well as cash prizes, you could also end up in the Free Spins feature if the pointer falls nicely. 5 free spins are awarded complete with a 5x multiplier. Any bonus symbol that hits here adds another spin on the wheel. The backdrop in Vegas Diamonds might look very flashy but this is a pretty straightforward fruit machine. ELK Studios has added some decent extras which certainly liven up the play though. You can expect to land them pretty regularly too. There are some big potential rewards on offer here though with maximum payouts topping out at some 2,000 times your stake. 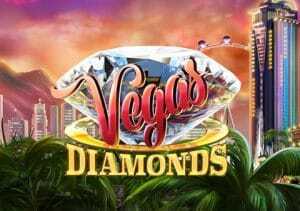 If you fancy playing a classic fruity that been given a glitzy twist or 2 then Vegas Diamonds is a pretty good place to start. If you unfamiliar with ELK Studios, I suggest you try Poltava Flames of War and Wild Seas.